Recently when I was working on my first Firefox extension, I struggled for a while to figure out the best way to work with the code - the script, CSS, etc. - involved with the extension. I like using Visual Studio as my environment for the other projects I’m on, so I thought I’d look around and see if other folks had figured out how to use it while working with Firefox extensions. The closest I got was this article over on DevSource which really talks more about creating the extension’s folder structure than it does about how you actually manage the project in Visual Studio. With that, I figured it was up to me, and here’s how I got it working. First, follow the Mozilla instructions on setting up a developer profile for extension building and creating the base extension structure. It might even be worth getting the full Hello World plugin running so you know you’ve got something working to start. You have a folder that houses your extension (“ExampleExtension”) and then you have the actual folder structure under that which has the extension code (“extension”). Ostensibly, you’ll end up zipping everything under “extension” into an .xpi file for distribution later. We need to create the solution you see in the folder right above the extension code so fire up Visual Studio. Go to “File->New Project” and under “Other Project Types” click “Visual Studio Solutions” and elect to create a Blank Solution. Put the blank solution in the folder right above the main extension code (“ExampleExtension” in the above folder tree). Save the solution file and close it. Visual Studio always does this thing where it creates a folder for the solution but you don’t want that folder here - you’ve already got a structure you’re working in. Go grab the .sln file that was just created and put it in the folder right above the extension code (“ExampleExtension”). You can then delete the folder Visual Studio stuck it in as well as the .suo file. You should have the .sln file right above the “extension” folder with your Firefox extension code, just like the picture above. Now open the solution in Visual Studio. We’re going to use the Web Site project type to work with the extension code. 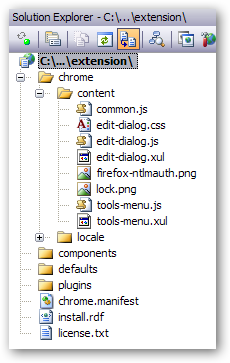 Extensions are mostly XML, CSS, and script anyway, so it mostly makes sense, right? When you click “OK,” it’s going to find the extension folders and such you already have. It will then ask you how you want to proceed. Select “Open the existing web site” and click OK. 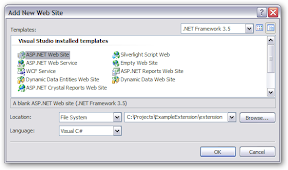 This will add everything for your extension into the “web site” without adding anything to it. You should see it all in Solution Explorer. Here’s a screen shot of my extension in Solution Explorer with all the requisite files. That’s it. You should now be able to add, remove, and update files for your extension from Visual Studio. Now, I know I could install Eclipse and do things differently, or choose some other environment, but I really wanted to see how VS would work. Seems to work reasonably well, at least for what I’m doing. In that dialog, click “Add” to add a new browser. In the “Program Name” box, type the full command line that you need to run the developer profile with (you have that from when you set up your extension developer environment). In the “Friendly Name” box, put something like “Firefox Extension Developer Environment.” Then click OK.
You will get warned with something that says “File name does not exist, is invalid, or contains parameters that cannot be validated. Do you want to change your entry?” Say NO. That warning will close and the “Firefox Extension Development Environment” browser will appear in the list. How about building/packaging the extension? I haven’t figured out a way to do it from inside Visual Studio (though I’m sure you could through post-build tasks or modifying the .sln file directly), however, with the use of MSBuild Community Tasks I’ve got a very simple build script that zips up the extension as an .xpi in a build_output folder (peer to the extension code). Yours for the taking. YMMV, no support, no warranty expressed nor implied, etc. Yeah, that’s a lot to just build a zip file, but it always cleans out any existing build and repackages the thing, plus if you end up having more to do (like adding other files or doing additional filtering), this is a starting point. Hopefully this will help some of you folks trying to break into Firefox extension development! UPDATE 7/8/2011: MozyHome has changed their pricing so I’m using CrashPlan to back up my Home Server now. I’ve been looking for a good online backup solution for Windows Home Server for a while. I’ve been using KeepVault for almost a year now and it works acceptably - there have been some kinks in the plugin (don’t let your backup history log get too big and then try to view it or you’ll lock the console), but overall it’s decent. The problem I have is the cost. I have about 200GB of data to back up. That’s the important stuff - all my photos, my music collection, and my documents. I don’t need to back up my 5TB of DVD images because it’d take longer to restore over the network than it would to just rip the original source material. Carbonite $55 Terminal Service installation. KeepVault $188 Plugin for WHS Console. Jungle Disk/Amazon S3 $360 + data transfer and request costs Plugin for WHS Console. iDrive $499.50*** Terminal Service installation. MozyPro $1200 Terminal Service installation. * backupanytime.com and IBackup support Windows Server 2003 (which WHS is based on) so you might be able to hack around and get it to work. I couldn’t find anyone who’d blogged success with that. ** MozyHome specifically does not support Windows Server 2003, nor does it support WHS. You have to use MozyPro for server-class OS backup. Yeah, that’s dumb, and I’ve told them so. I’m not a business so I don’t understand why I’d be charged business prices just because I happen to store my data centrally. *** iDrive jumps from 150GB personal plan ($49.50/yr) to a 500GB business plan ($499.50). Since I have 200GB to back up, I listed the 500GB plan cost. I don’t want to hack anything on my Windows Home Server. Is it worth an extra $133/year to get the KeepVault support for WHS or can I figure out a better way to get a client backup program to do the work for less? I went with the client backup and chose MozyHome. Why not Carbonite? I’ve had experience with MozyHome and it works really well. Honestly, it came down to brand affinity. You could have chosen Carbonite and tried the Terminal Service installation (though it’s unsupported, which is why I didn’t go that route), or you could use Carbonite in the manner I’m using MozyHome. Now that we’ve picked a service, how do we hook it up? Actually, it’s pretty simple. An external USB drive big enough to hold the data you want to back up. It doesn’t have to be the same size as your full Home Server storage; it just has to be enough to hold the important stuff you want to have backed up. You may not need everything on your Windows Home Server backed up, and in some cases you’re probably using the file doubling offered by WHS, so you need to do some calculations on space. For example, you probably don’t need to back up your recorded TV episodes. I picked upa 1TB USB drive for $93 from NewEgg. A copy of Allway Sync for $20. You’re going to use that to get your WHS data onto the external drive. Install Allway Sync onto a Windows client computer that’s generally always on. This will be the computer that backs up your WHS data. Plug the external drive into that computer. For each of the Allway Sync jobs you set up (one per shared folder), set them to automatically synchronize on a scheduled basis. This will add an entry to the Windows Task Scheduler. Run the sync nightly (or more often, if you like). Make sure to select the “Wake up computer to perform this task” option so the sync will wake your computer up if it happens to have gone to sleep. Run the sync the first time and verify the results. Look at what got copied onto the external drive and make sure it’s getting everything you want. Sign up for a MozyHome account. I got the yearly renewal in case some better backup solution pops up for Windows Home Server between now and then. Download and install the Mozy software on the computer with the external drive. Nightly (or more frequent) backups to the external drive allow you on-site access to things you might have accidentally deleted in the last period. Continuous online backup to Mozy ensures you have historical versions of files and things that have been removed from the nightly backup. It also ensures that in the event of catastrophe, you have things stored elsewhere. I have this set up and running now and it works like a champ. No maintenance required - the sync job runs, the Mozy software backs it up - appliance-style, just like I want. From a cost perspective, it’s a no-brainer: $113 startup (drive and sync program), $55/year for backup space - beats the next best thing, KeepVault, by $20 the first year (including startup costs) and $133 each subsequent year. It’s potentially a little convoluted, but for the price and the results, I can’t complain.